It seems that interest in crystals, empaths, and anything metaphysical have grown substantially in recent years. I think it's wonderful, because a return to getting in touch with our energy and spirit bodies can be so helpful in dealing with the stress of living in modern society. I believe that so many years of living in a society driven by money, achievement, and getting ahead have left many people longing for more. Many are getting hip to the fact that we are energetic beings, and we must care for our energetic body as much as our physical one. I didn't even really get to know the word "empath" or what it really meant until about four years ago. I grew up in suburban Illinois in the 80's and 90's, and nobody told me what that was. The internet wasn't prevalent yet, and I had no idea that I had the personality trait that has been dubbed HSP, or Highly Sensitive Person. About 20% of the population has this, with the highly sensitive also having highly empathic qualities where they actually feel the emotions of others as if they were their own, usually without even realizing it. As you can imagine it was difficult to grow up this way having no idea what was happening to me. I was dubbed "sensitive" and "emotional". I even believed that I was claustrophobic because I became overwhelmed in crowded public places such as concerts. I now know that I was frazzled by all of the energy I was feeling, and did not always deal with it in healthy ways. After finally being properly diagnosed, I have learned from various sources over the last few years some methods to cleanse and strengthen your field. I will list them here, see what resonates with you. While this post is directed at empaths, anyone can and should benefit from these practices. This is a great alternative to burning sage or palo santo. If you live in a place where you cannot burn things, or have a partner that detests the smell, (as I do) the essential oil sprays work well. You simply use them as you would the smoke, spritzing the mist into your aura and around your body in a circle. You may also cleanse your home this way as well. These sprays can be found in health food stores and metaphysical shops, look for ingredients like sage, juniper, sandalwood and lavender. Cleansing in saltwater can be such an amazing relief. 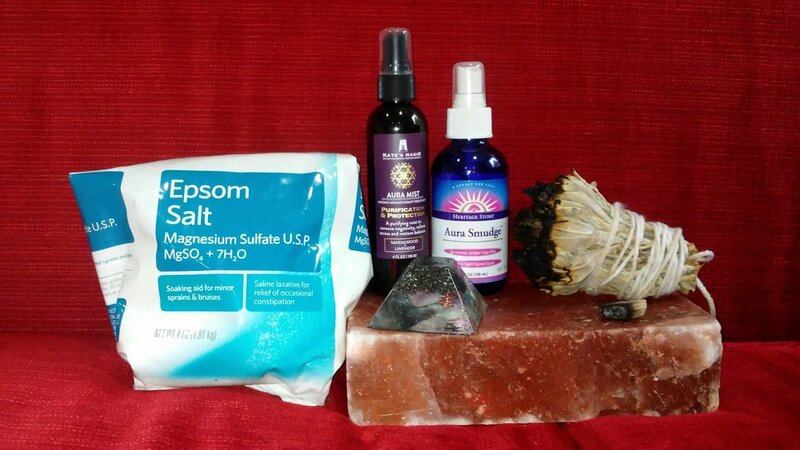 Taking an epsom salt bath at night before bed can cleanse your energy, and also relax you. Add whatever essential oils you like. If you do not have a bathtub and only a shower, you can fill a jug with water, add salt and essential oils, and let it sit and marinate for several hours. Then, pour the mix over your body, rubbing the salt in, it is also a nice exfolient. I follow every shower with a cold water rinse, as cold water cleanses the energy as well as tightens the skin. Some spas have saltwater jacuzzis, and if you are lucky enough to live near the ocean, nothing is more cleansing than a swim in the ocean. A day at the beach can really revive you, with the added benefit of earthing in the sand. They sell Himalayan salt blocks online that hunters use to attract dear. But you can use it to put your feet on and cleanse your energy. After a long day of dealing with people, just put your bare feet on that block for about fifteen minutes, and feel the relief. Reiki is an energy healing technique, where a practitioner uses a hands-on, or hands close technique to channel energy from higher beings into the recipient of the healing. (It can also be sent from a distance.) Feeling drawn to get more in tune with my own energy, heal myself and others, I became attuned to become an Usui Holy Fire II practitioner a couple of years ago. A friend of mine is an excellent reiki master and teaches others, but you don't need to become a practitioner yourself, you can book a session with a practitioner to feel the benefits of this amazing healing energy. Like anything of this nature, you must feel the results before you judge. Even my skeptical boyfriend always admits he feels better and his pain has subsided after a session. A reiki session can cleanse and strengthen your energy field. Of course if you have a physical condition, it is a supplement to seeing a medical doctor, but can work wonders for pain and healing. EMF from wifi, cell phones, and cell phone towers interfere with the human energy field. The dead orgone energy that comes out of these devices are harmful for everybody, especially empaths, who are more sensitive to them. Avoid EMF as much as possible, and use scalar energy devices, to mitigate that dead energy and help you to have a stronger, more powerful energy field. These devices also promote better sleep, which makes you feel better in general. The human energy field always feels it's best when connected to nature. A walk in the park can do wonders for clearing and strengthening your energy, breathing in the fresh air, or prana, life force energy, and connecting to the Earth. A camping trip can be even better, but as long as you have a place near you where you can go and get outside and breathe, that is what is important. If you can, take off your shoes and connect to the ground, we can receive a wonderful energy from the Earth to replenish us when our energy is depleted. Yes, I have even heard that wearing jewelry, such as metal bracelets, precious stones and crystals that conduct energy, can help to protect your energy field. Whether you believe this or not, most of us are wearing it anyway for decoration and self-expression, so if it really does add an extra protection barrier, bonus! An empath should never feel bad about taking the time for self-care. While this trait can sometimes feel like a curse, it is a gift, as empaths are the people who care about others enough to want to help or speak out. Always make sure to take time out for yourself as much as possible to recover from all the energies we encounter out in the world. Take care of your health, avoid alcohol, drink plenty of clean water, and eat healthy foods to raise your vibration. While I am always learning new things, I feel like all of these practices help me to feel better, and I hope that anyone reading this finds them beneficial as well. Protect yourself and protect your health!